Svoboda, who finds inspiration in nature’s organic patterns and forms, will be presenting new work at her exhibit, Insula Cyan. Many of the pieces that will be on display were created during recent residencies in Seattle and Key West, where she worked on large-scale cyanotypes. Vivid Art Gallery will host an art opening for Featured Artist Allison Svoboda and Local Artist Keith Decker on May 4th at its monthly First Friday event. The event, which runs from 5-8pm, is open to all and is free of charge. In addition to great art, there will be refreshments and live music. Svoboda, who finds inspiration in nature’s organic patterns and forms, will be presenting new work at her exhibit, Insula Cyan. Many of the pieces that will be on display were created during recent residencies in Seattle and Key West, where she worked on large-scale cyanotypes. Cyantotype is an old photographic printing process that produces a brilliant cyan-blue print (think blueprints) by coating paper or fabric with chemicals, then exposing it to sunlight. Svoboda layers native grasses, leaves, and flowers onto Cyanotype treated canvas or paper. These block the sun, thus the chemical change, leaving their imprints in white or light blue against a dark blue background. The result is both organic and mysterious, as if one had just stepped into a deep forest or tropical jungle. In addition to cyanotypes, Svoboda will exhibit one of her Mandalas, which are assemblages of torn bits of Japanese paper painted with ink in feathery, light strokes. Her mandalas have a beautiful Zen-like quality and have been exhibited all over the world. 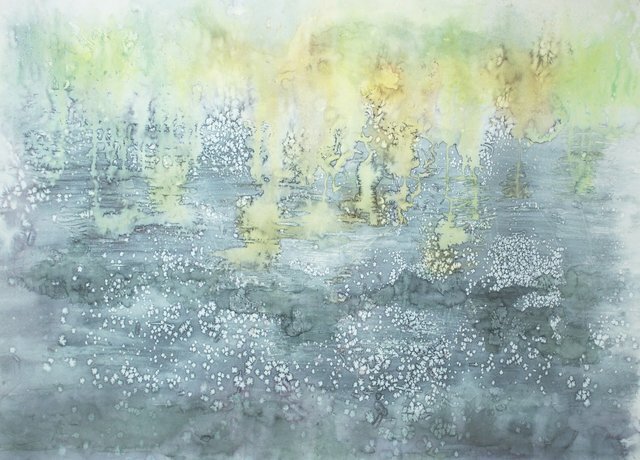 Also on display will be a new piece in her watercolor “Refraction” series, which consists of large-scale abstract landscapes featuring flowing drips and runs in gorgeous colors. We are also excited to welcome Local Artist Keith Decker with an exhibit of his work. Decker’s art explores the human impact of U.S. government policies both at home and in Guatemala, where he has spent many years working to build and fund an orphanage for children left without parents by that country’s civil war. His pieces are powerful, challenging, emotionally charged. His work is on permanent display at the Vietnam Veterans Museum in Chicago. The Hubbard Woods Design District will once again be sponsoring a “Cocktail Hop” in conjunction with First Friday. Fourteen neighborhood stores will be open and serving a signature drink. The gallery will be serving “Matisse Mules.” Details are available at www.shophubbardwoods.com.